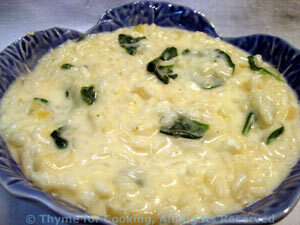 Ricotta Risotto, a luscious, creamy side dish from Thyme for Cooking. This is based on a recipe from the cook book 'Risotto'. This is a very white, very creamy, very rich risotto. As always, the end result should be almost soup-like, never stiff. Add the spinach at the end so that it just wilts. Leftovers are for Risotto de Salto. Slice the spinach into strips. In medium saucepan heat butter and oil over medium heat. Add shallots and sauté until tender, about 5 minutes. When wine is almost absorbed add a 1/2 cup of stock, stir. When stock is almost absorbed add another 1/2 cup and continue adding 1/2 cup at a time and stirring. Reserve 1/4 cup to add at the end. Taste the rice. They should be just 'al dente' - slightly resistant to the tooth but fully cooked. You can add a bit of water at this point if needed but you shouldn't have to. Add the rest of the stock, the spinach and both cheeses. Stir vigorously over heat to combine well and wilt the spinach. Note: Contrary to popular belief, it is not necessary to stir risotto constantly. Just stir often and somewhat vigorously when you do.